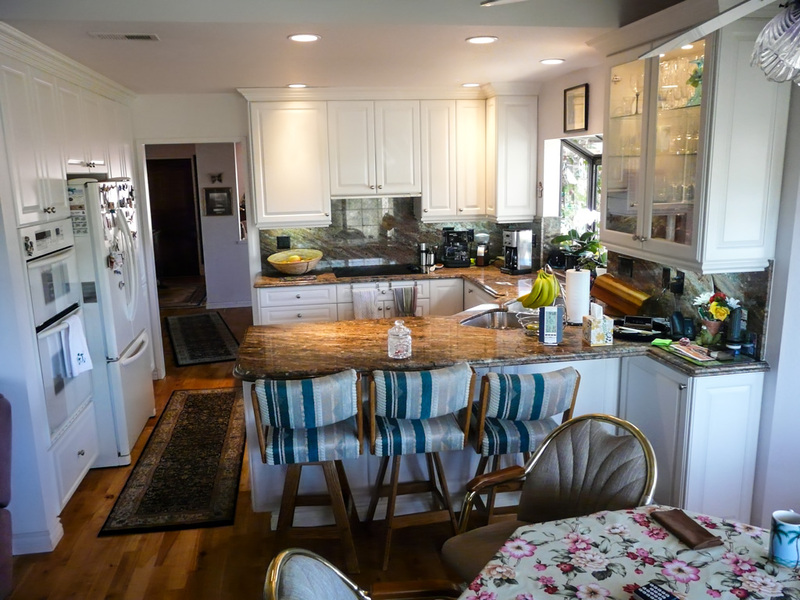 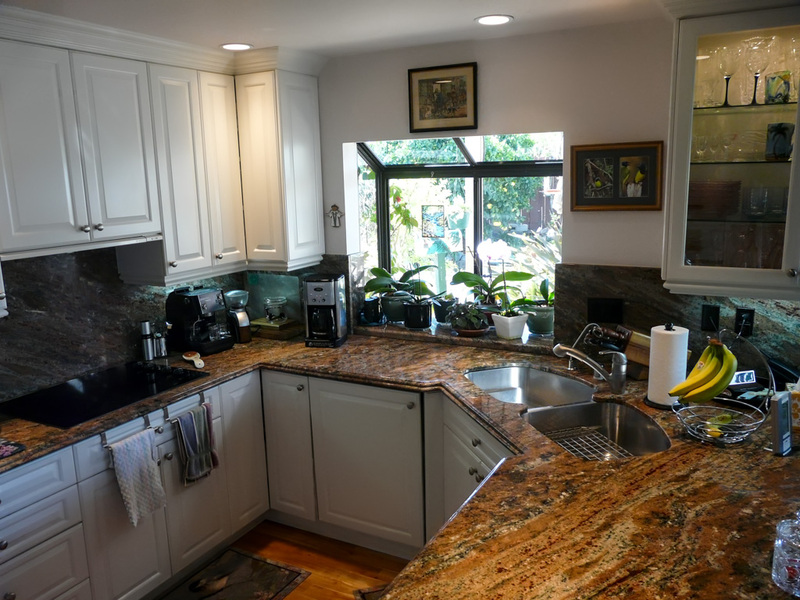 This client’s primary objective in updating this small 1950’s kitchen was to try to get more counter space, particularly between the sink and cooktop, as this is every kitchen’s most utilized food prep and work area. 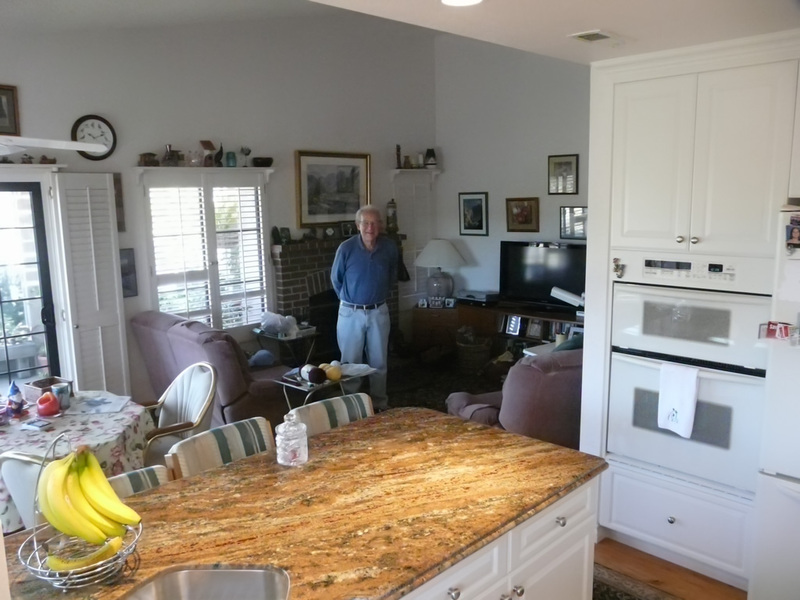 The original builder, like most do, put the sink and cooktop almost right on top of one another in the left corner of this kitchen. 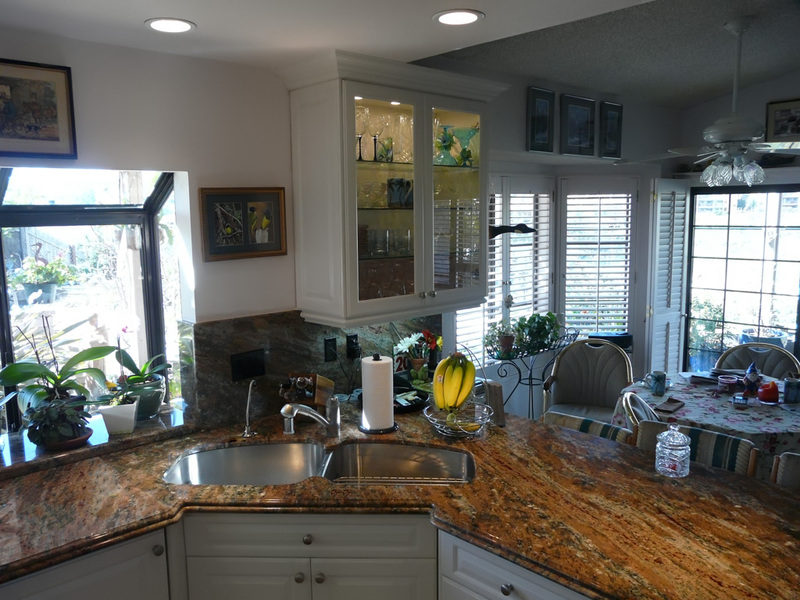 Our primary layout change was to move the sink to the right and place it in the corner, still affording it a view out the window but no longer centered to the window. 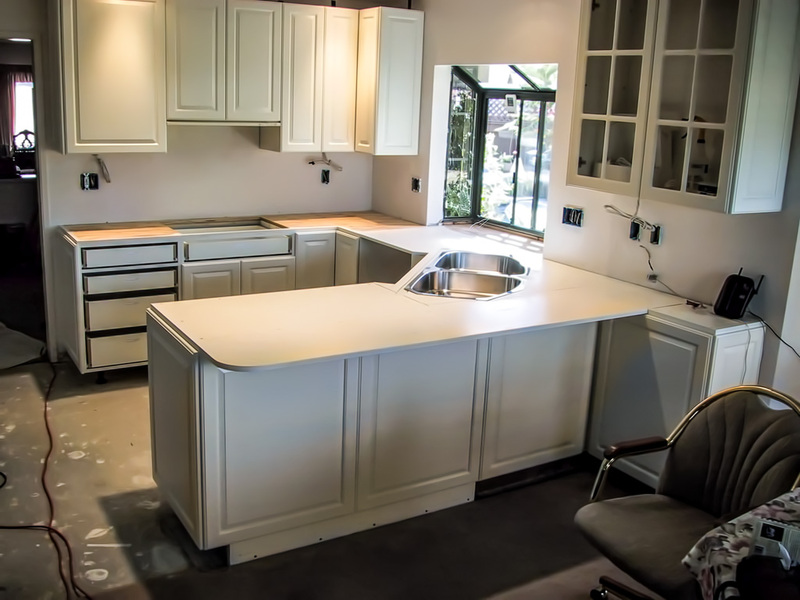 This change gave the client the work counter they were missing and made the kitchen much more functional. 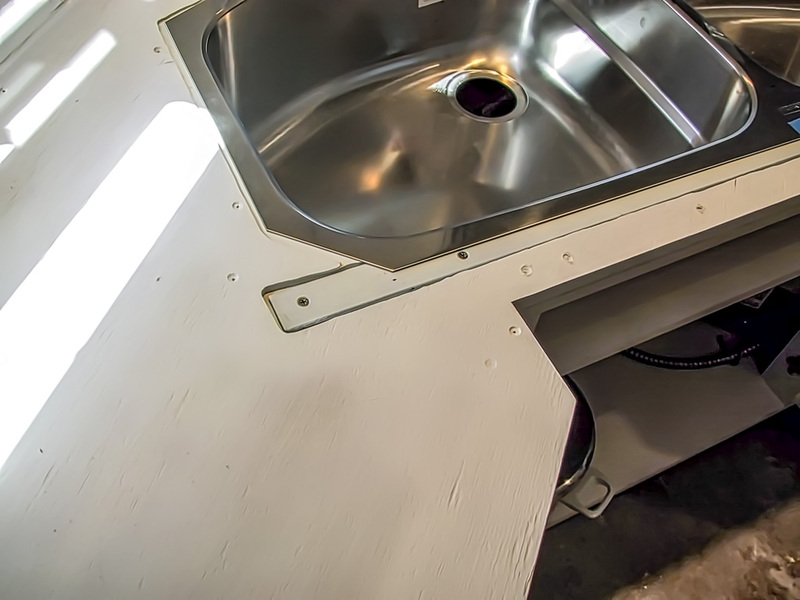 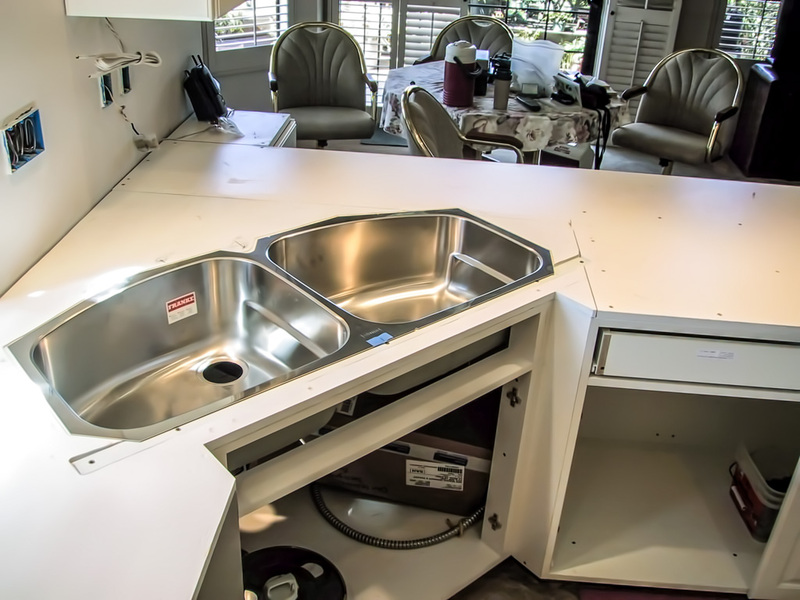 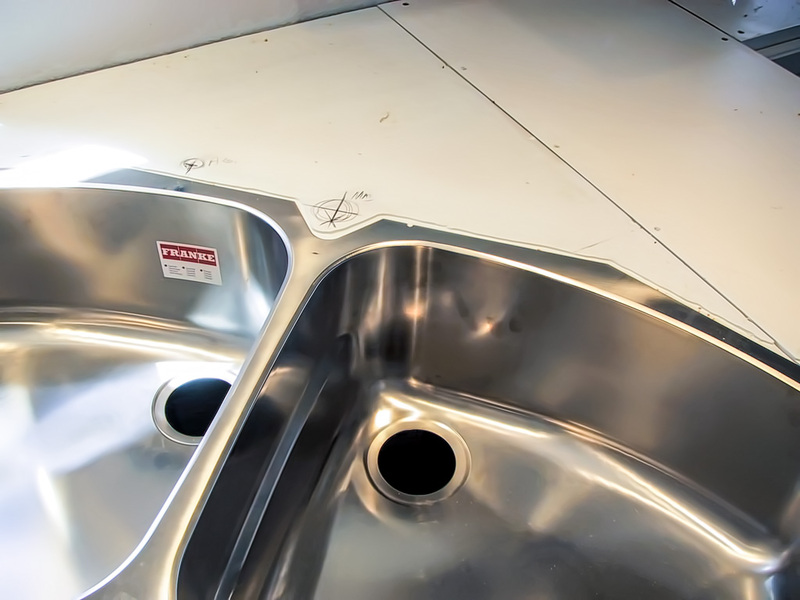 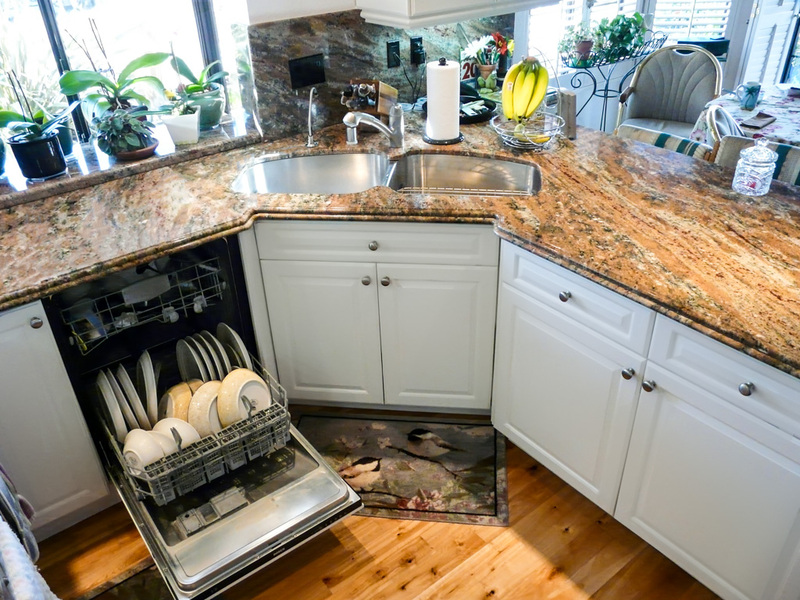 The corner sink application also allowed the client to use a 39″ sink, much larger than most standard sinks, which the client is real happy with. 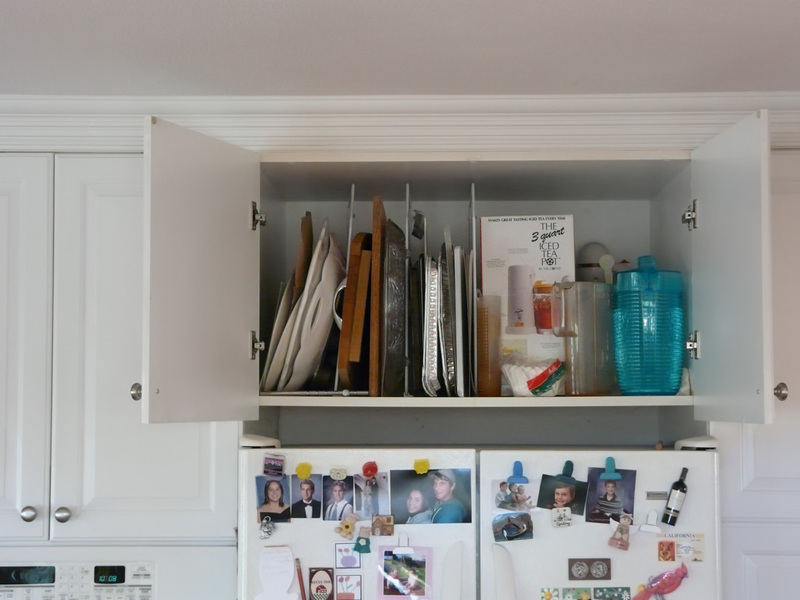 We put in all the standard convenience features to make the cabinets more accessible and usable: roll out shelves, lazy susans, etc. 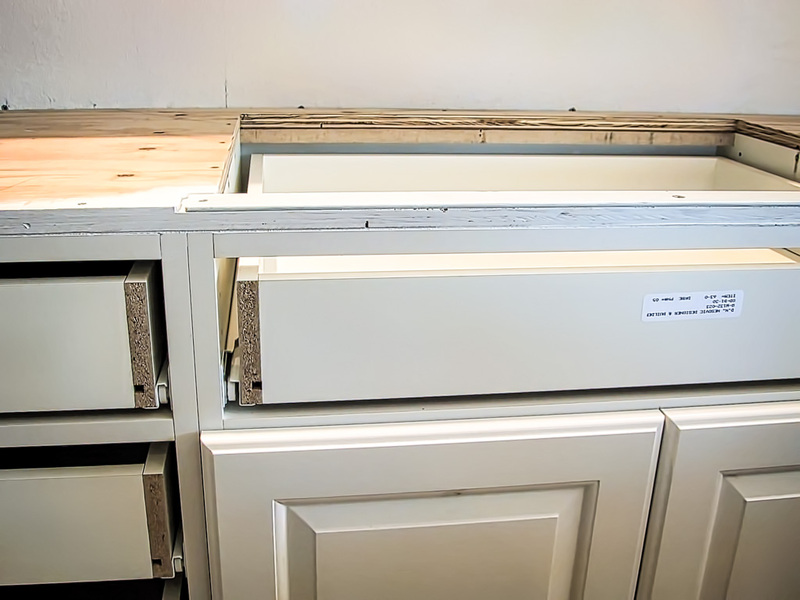 in base cabinets and pantry. 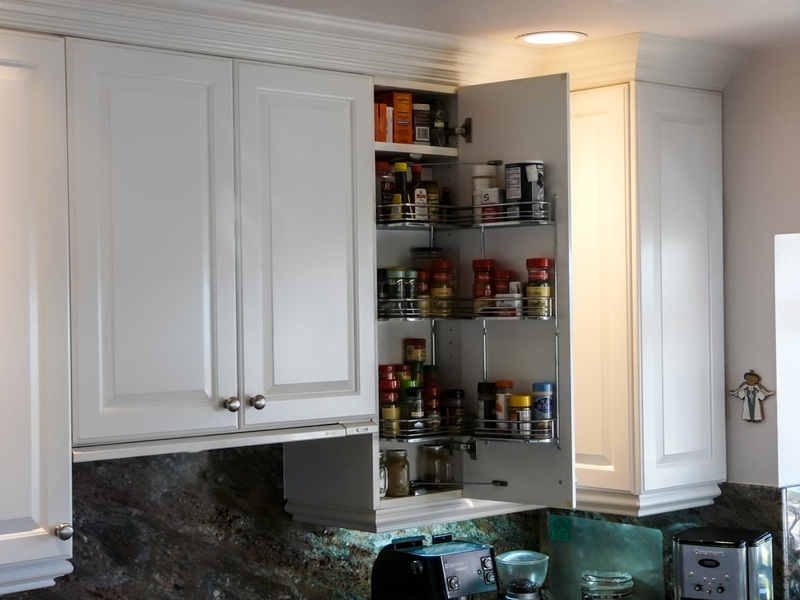 Additionally, a pull out spice rack system was installed in the wall cabinet to the right of the cooktop. 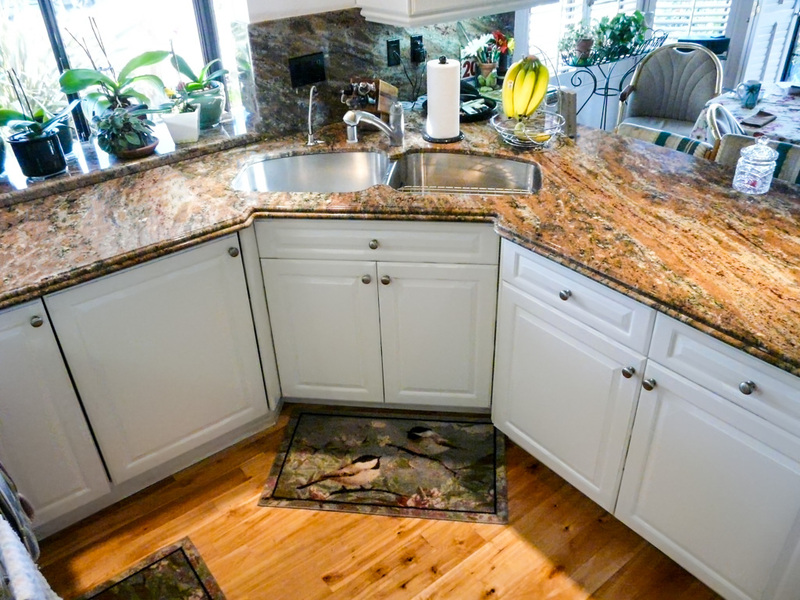 In shopping for materials the clients, first selections were the Rustic Cherry floor they used throughout the first floor and the Crema Bordeaux Granite countertops. 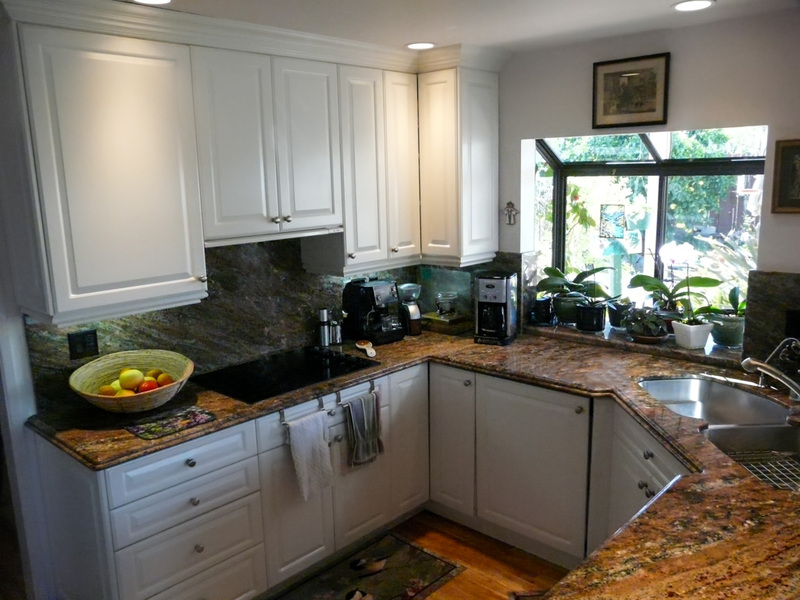 After making those selections, it became obvious to the client that the cabinets needed to be a very classic and neutral white to tie the two dramatic color choices for the floor and counters together. 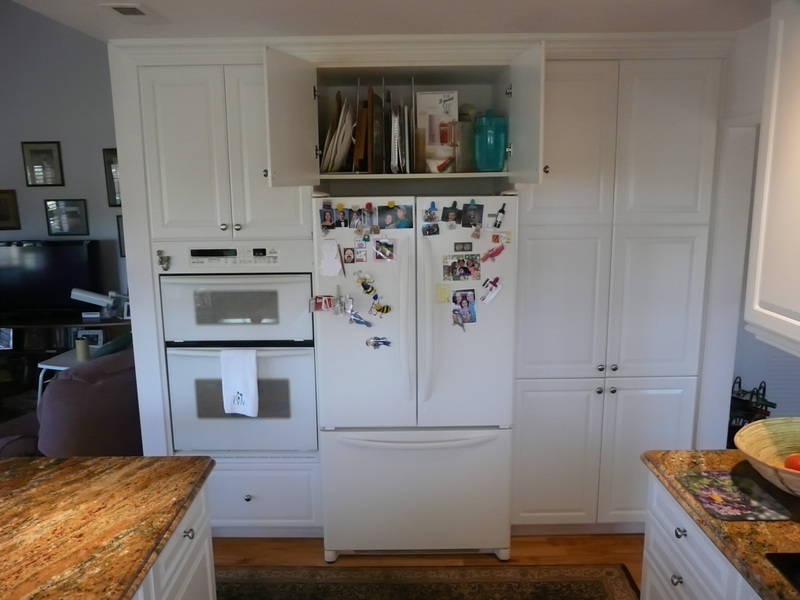 A classic white painted raised panel door “look” was the unifying element that makes the other choices work together. 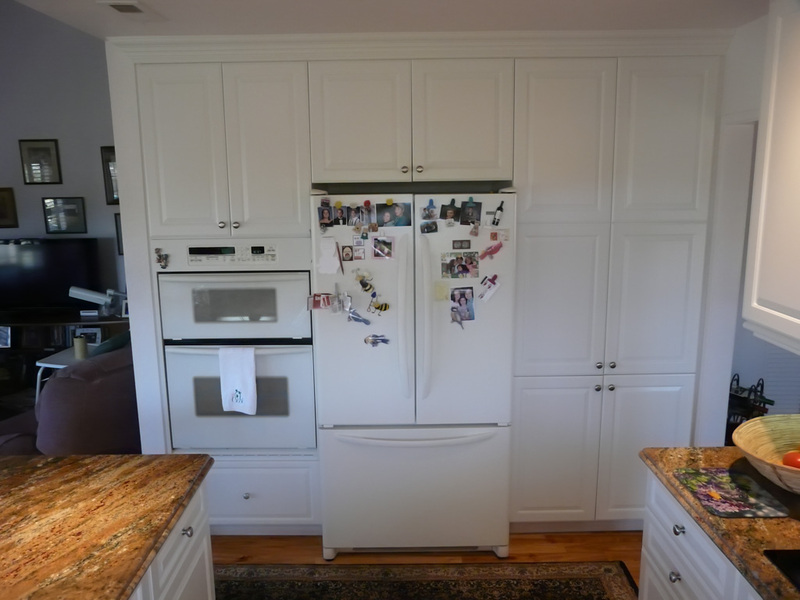 Like the majority of my clients who originally requested that white painted look, as you will see in my portfolio, when I showed them samples of white raised panel thermofoil doors and explained how easy they are to keep clean, how they last many years longer than a painted door, and how much less expensive they are, they selected the thermofoil. 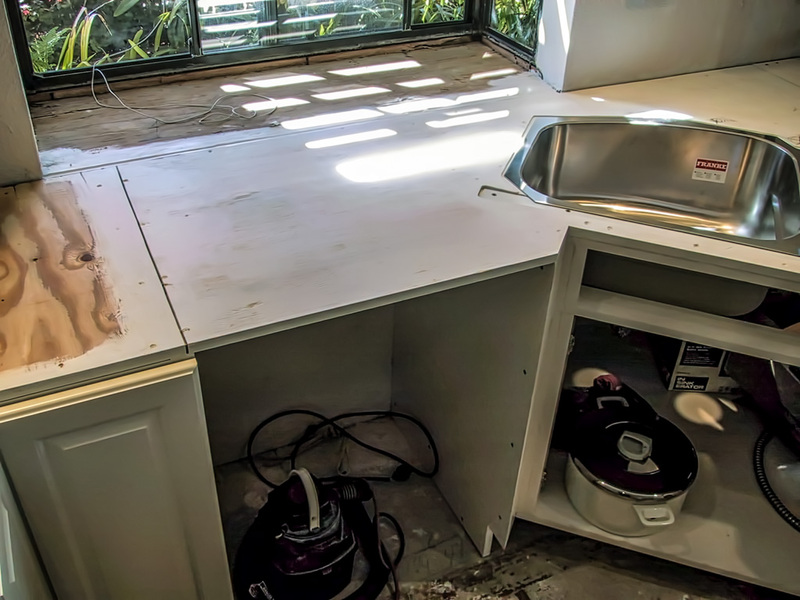 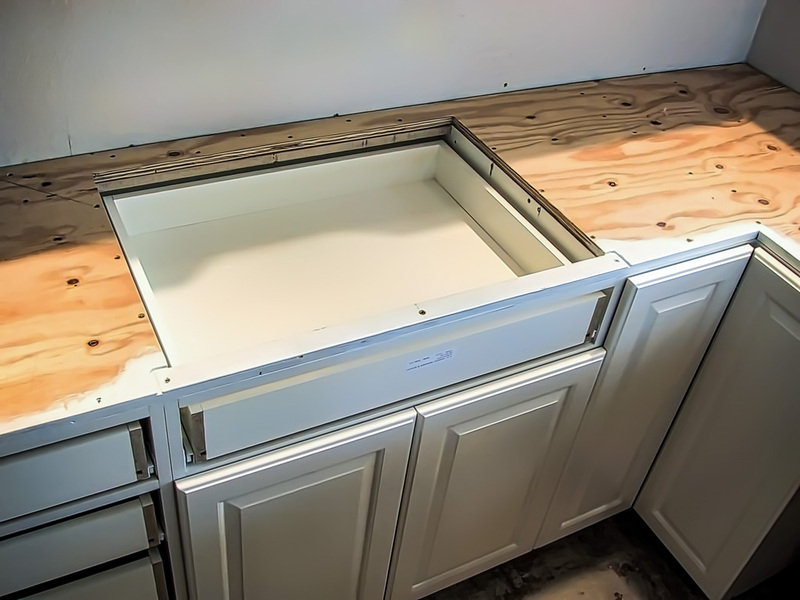 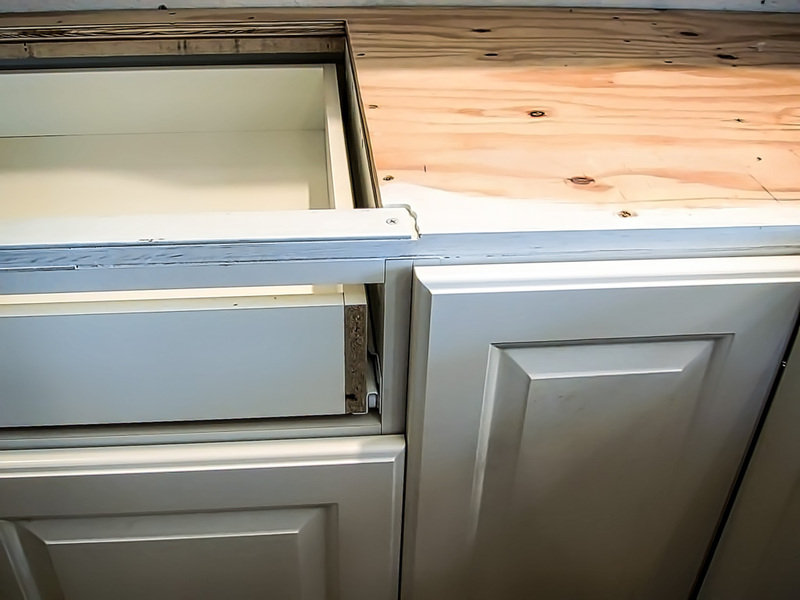 Unlike most other kitchen fabricators, I do not limit the molding options for a thermofoil cabinet project like this to only thermofoil light valence or crown moldings, since they are very limited in size, shape, and color. 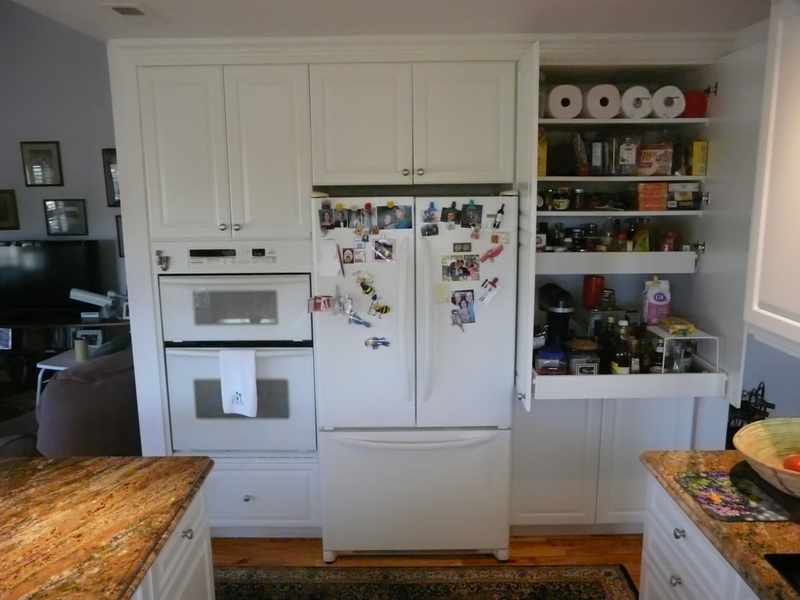 When I say these doors look like painted doors, I am not exaggerating. 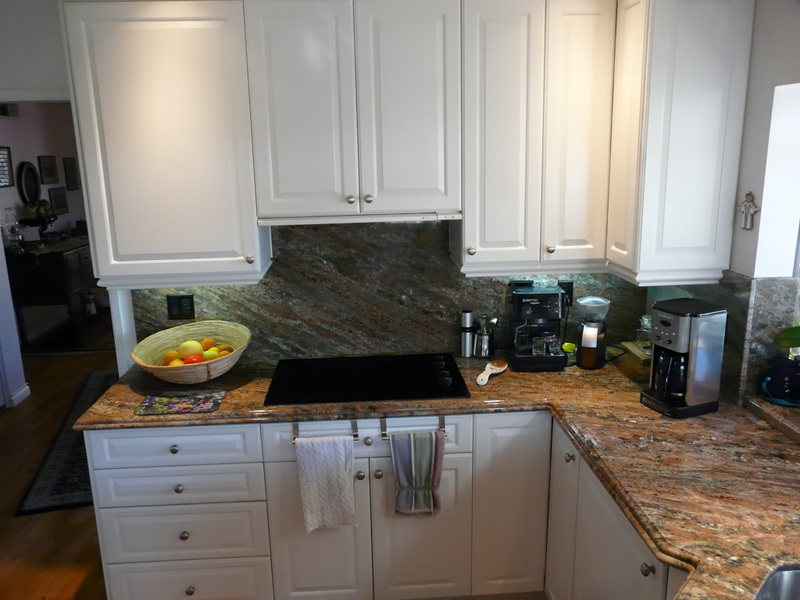 What I have always done with solid color thermofoils like this is offer all the same molding that we use on real wood projects, and simply paint the wood to match the thermofoil. 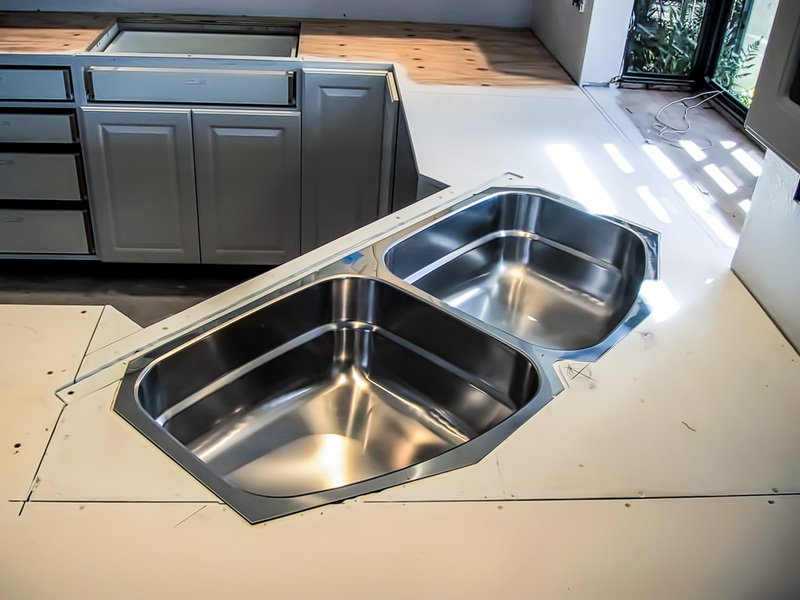 This has always given my thermofoil projects much greater depth and detail than other manufactures, who do not seem as capable of thinking outside the box and mixing materials to create unique and stunning detailed overall looks that can be shaped to any style, by the use of appropriate detailed moldings. 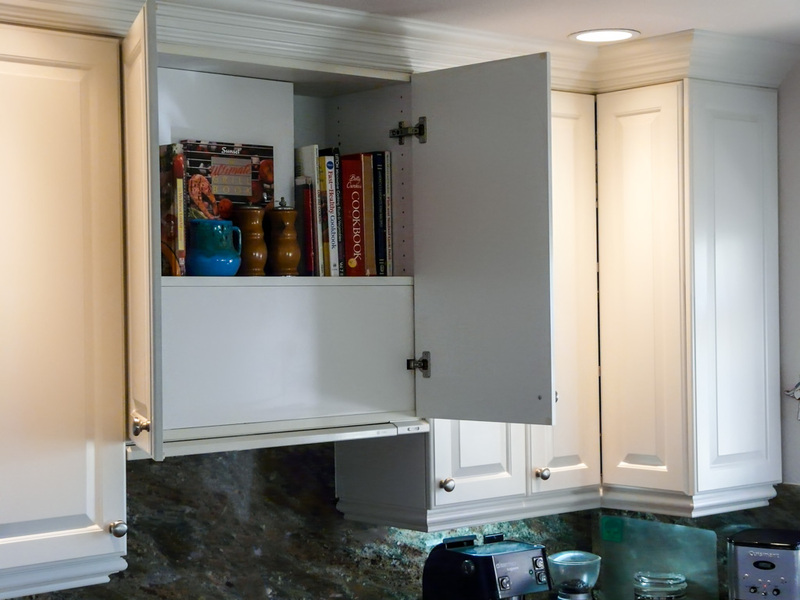 Classic, Mission, Craftsmen, Art Deco, and most other styles are not defined as much by the actual door style used as they are by the choice of how to accent the doors with accompanying crown, casing, or light valence molding that create the overall style. 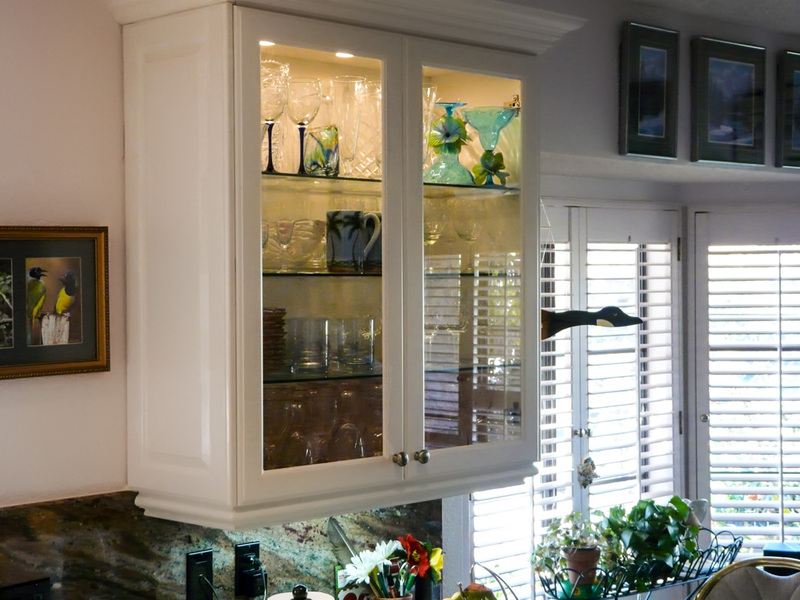 We added a glass door display cabinet with glass shelves and interior puck lights above the sink as a center piece display area for the room. 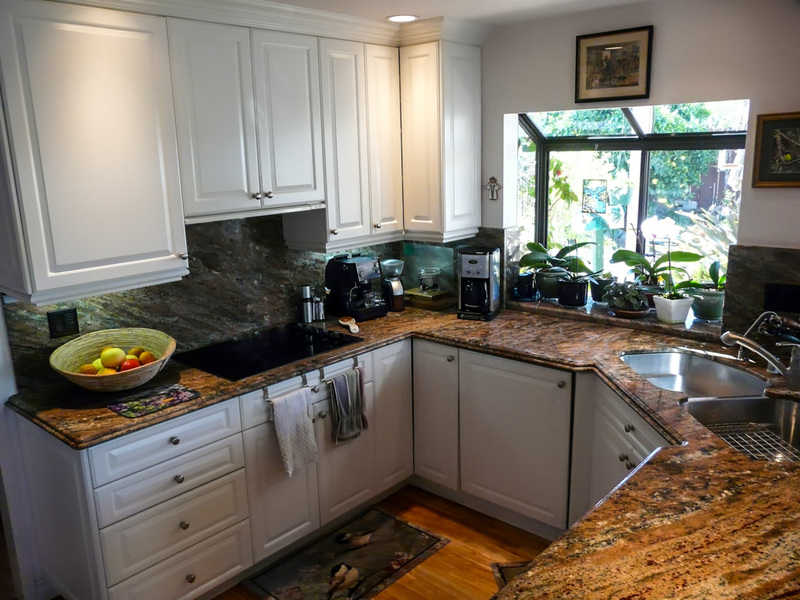 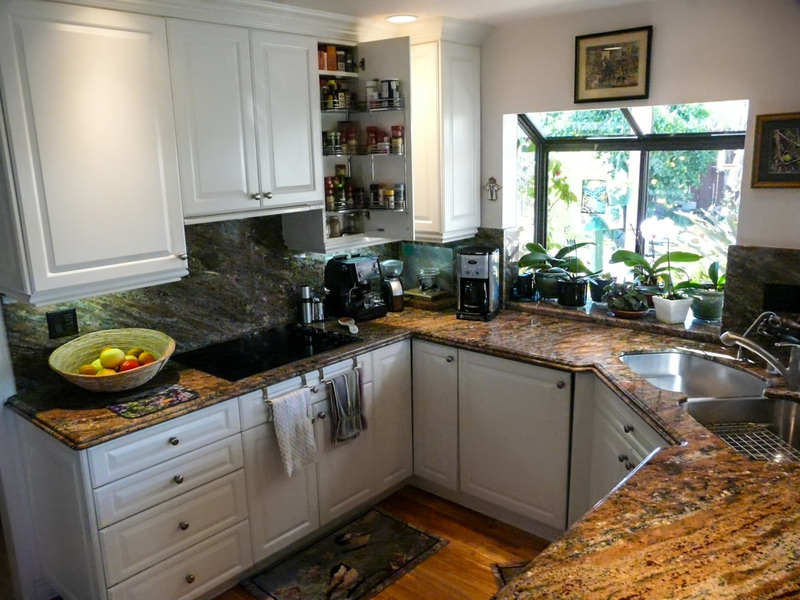 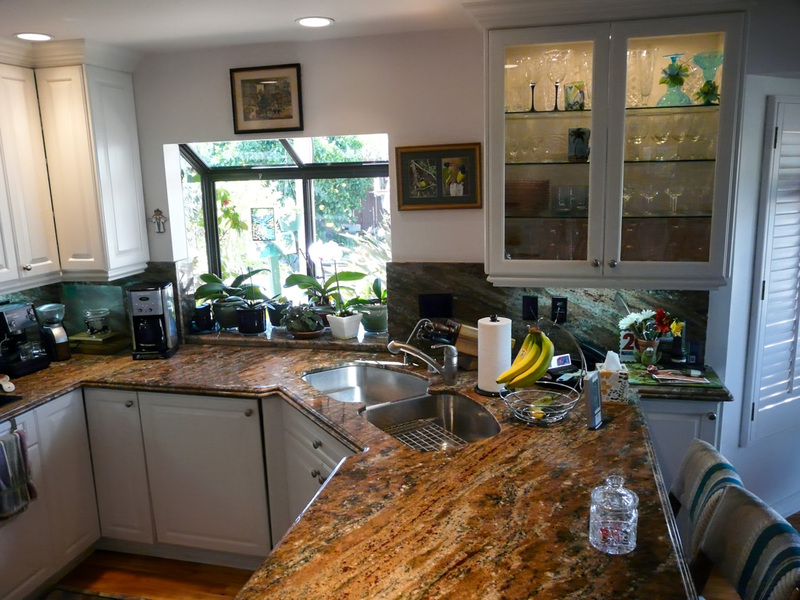 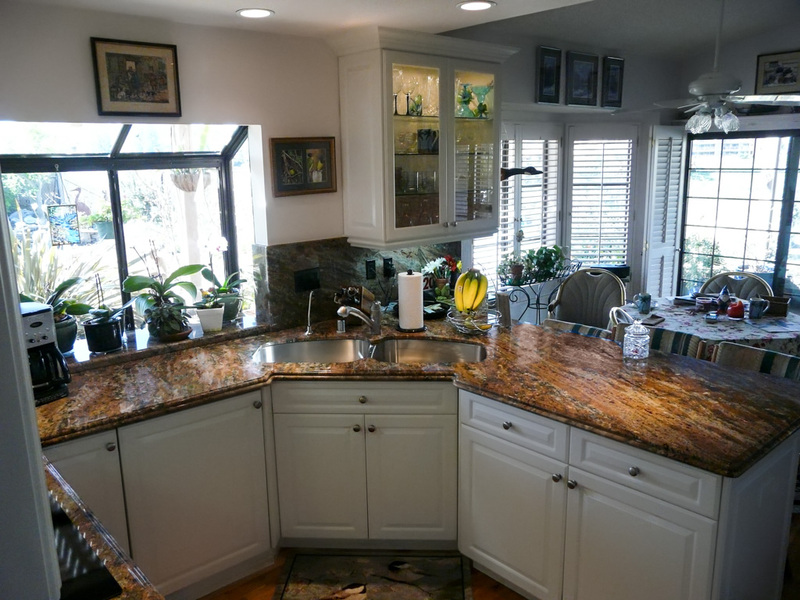 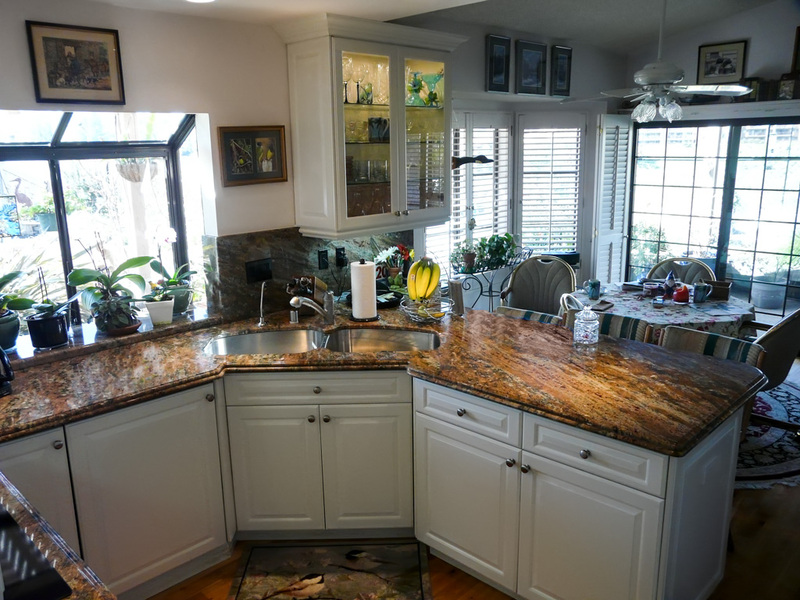 The garden window had already been installed by the client a few years prior to this kitchen remodel, we simply ran the new countertops out into it. 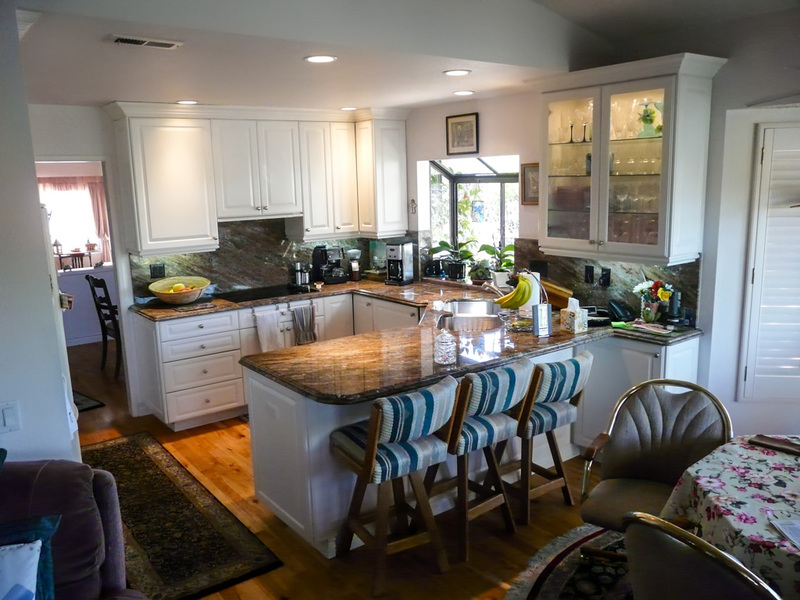 Notice the placement of the Halogen recessed down lights over the counter tops as you look around the kitchen, they are not in the typical brain-dead architectural geometric pattern seen in most magazines. 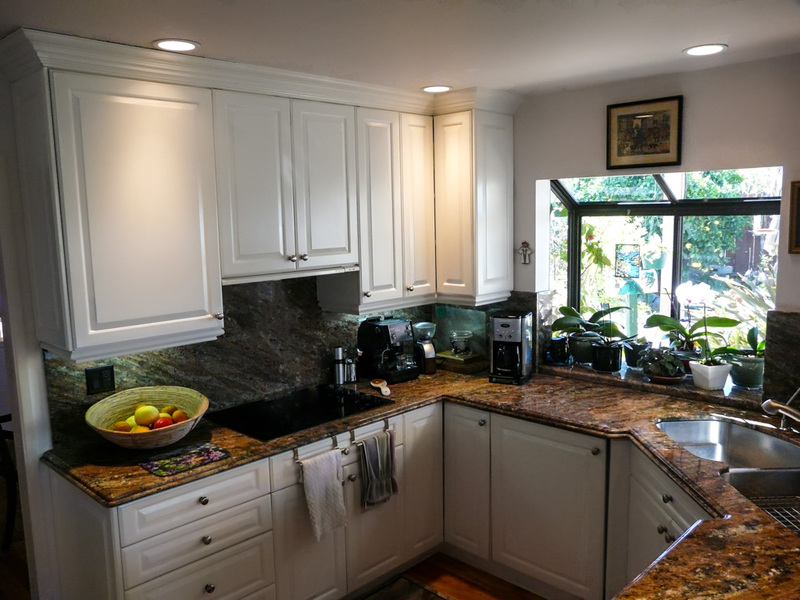 These kitchen lights are placed where they are needed over work spaces, in front of cabinets so the cabinets are highlighted and you are not standing and working in your own shadow like you would if the lights were behind you in a geometric pattern in the ceiling. 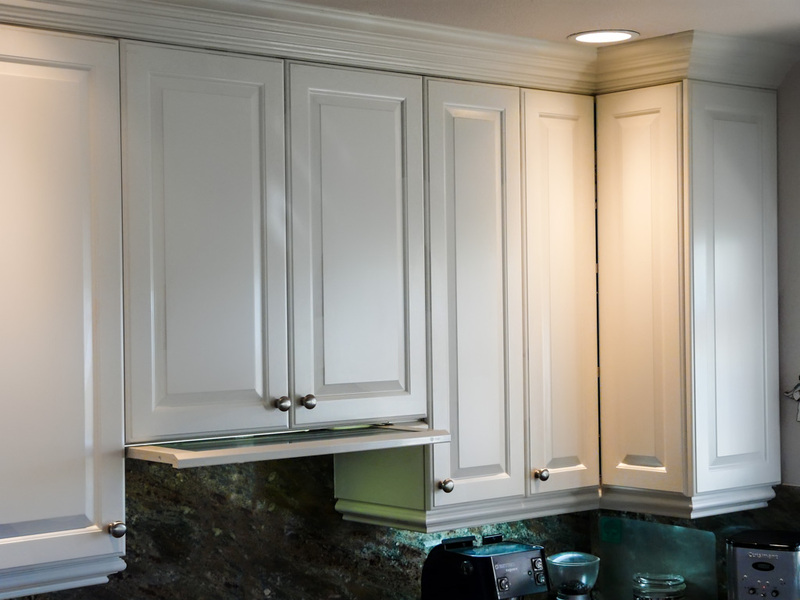 We also supplemented the lighting with under cabinet florescent lights. 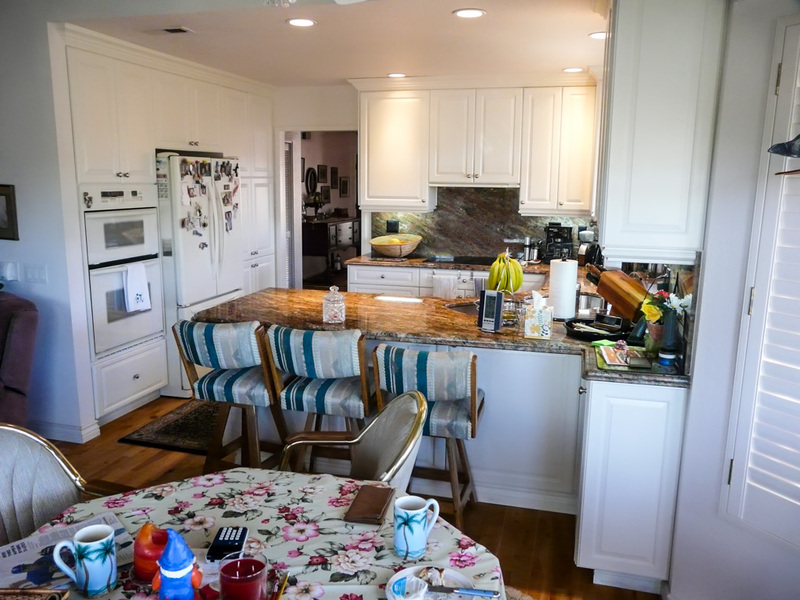 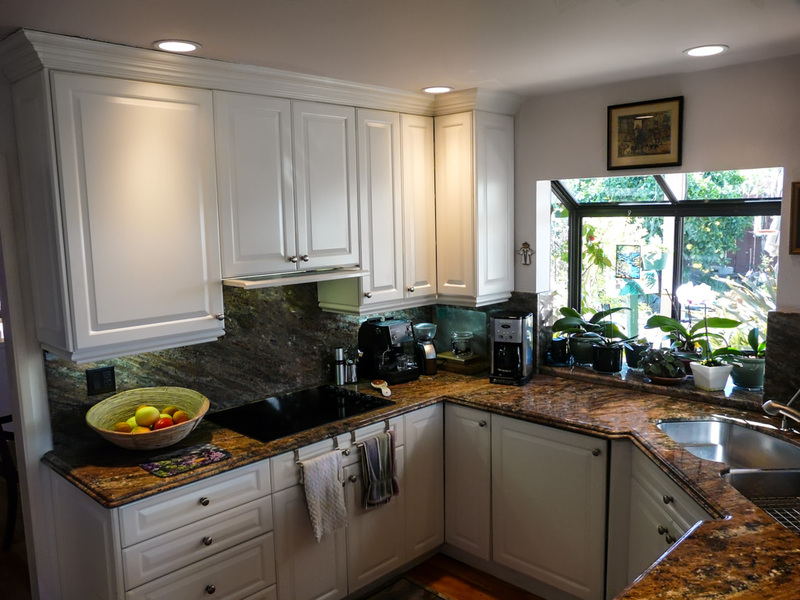 The only thing this kitchen needs to upgrade it to today’s standards is to replace the Halogen ceiling lights, fluorescent under cabinet lights, and xenon in cabinet puck lights with new LED versions of those same fixtures.